You know you’re in for a ride when within the first ten minutes two old people get up and leave the theatre. Such was the case in eXit Productions’ performance of Wonderland in Alice: The Uncertainty Principle, when a rant of dead baby jokes (and really good ones) drove an elderly couple from their seats and out the door, as (if by strange and absolute joyful luck) the monologue segues to the refusal of audience participation and the rest of the audience gets a bonus laugh as they exit. The production is like animation in a rotoscoped world. My first impressions were of a cosmic blend of Drawn Together, Family Guy, Michael Frayn’s Copenhagen and Donnie Darko, as told by Hayao Miazaki (Spirited Away, My Neighbor Totoro), with a short brilliant homage to The Cell (yes, the J-Lo horror/thriller). I don’t like a lot of the theatre I see, mostly because of actors playing the same things over and over and productions lacking imagination. This is so not the case here. The actors were all committed and extremely inventive; I never knew what was going to happen next. Every exit and entrance began with excitement; no one knows what’s going down next. I was leaning forward in my seat not because I was trying to get comfortable in an effort to stay awake, but in anticipation. Some of my favorite moments are a nuclear holocaust game of Monopoly, the creepy-as-all-sin character “Tofurky” and the appearance of Schrödinger’s Cat. The cast was wonderful, including Christa Hinckley (Alice), Joe Jung (Dodgson/Carroll), Carmen Rae Meyers (Empress), Terrence Monte (Death/Sushi/Tofurky), James Redfern (Devil/Ward Cleaver), Caitlin Sams (Queen of Sworads/June Cleaver), Megan Simard Schizo Cat/Hooha) and Miles Warner (Wolf/Syphilitic Worm). Great direction by Ben Gougeon and Doug Spagnola plays an important part in the success of the production, keeping the action moving for the audience, seated on either side of the stage. Margie Pignataro has written a great piece for our generation that actually explores the generation instead of commenting on it. eXit Productions is a theatre company to watch for in coming seasons. They are making quality theatre that speaks to the younger generations. If Wonderland had a full scale budget and was transferred to an off-Broadway club setting, like the Donkey Show, it would run for years. Go see this show if you can. 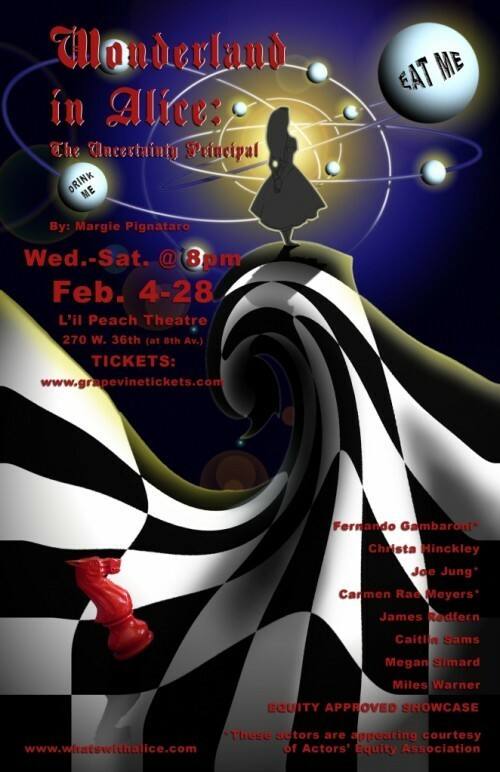 WONDERLAND IN ALICE: THE UNCERTAINTY PRINCIPLE premiered in Lubbock, TX with the Experimental Artists Theatre! (EAT!) in August of 2008. For more information please visit whatswithalice.com . Current performances run February 4-28 at the Dionysus Theatre Complex’s L’il Peach Theatre (270 West 36th Street, at 8th Avenue, NYC), Wednesdays-Saturdays at 8pm. Tickets are $18, available online at http://www.dionysustheatrecomplex.com/grapevine.html, by phone at 718.715.0599, or at the door. eXit Productions, now in its eighth year, is dedicated to producing new work from new playwrights. After its conception in Kalamazoo, MI, eXit has matriculated to New York with the goal of introducing new theatre from around the country to New York audiences; showcasing both established and upcoming talent. Past Michigan productions include: Sam Shepard’s True West, Christopher Durang’s Bettys Summer Vacation, Samuel Beckett’s Krapps Last Tape, JoAnne Akalaitis’ TI Jean Blues and original works by local playwrights.